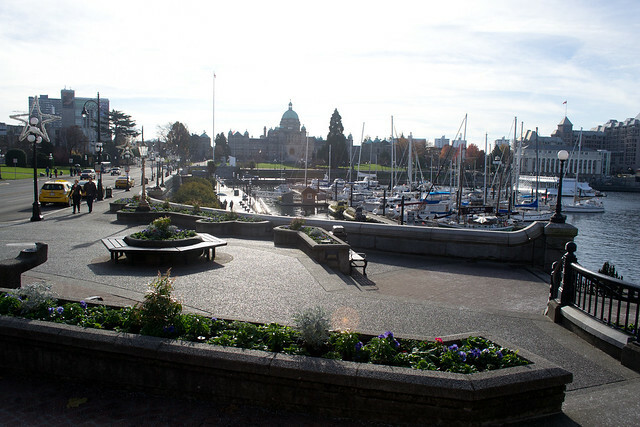 A little known fact is that I spent my university days in Victoria, BC. I haven’t returned since graduating 4 years ago and when an opportunity came up for me to speak about my time in Budapest, I decided to make a weekend of it. Revisiting my old haunts, catching up with friends and speaking about travel and why everyone should considering living abroad at one point in their life. The makings of a good weekend. 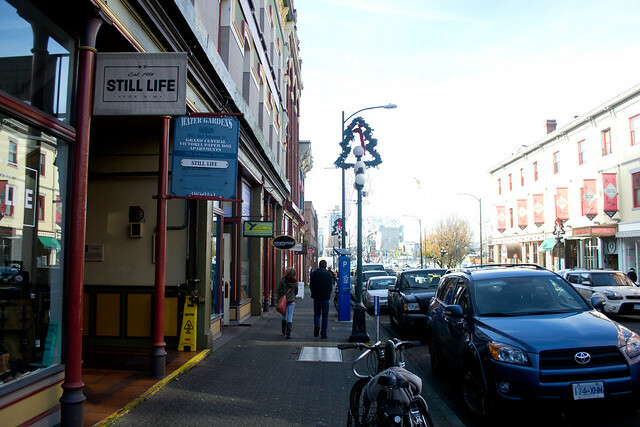 Here is how I spent my 24 hours in Victoria. It is interesting to go back to a place that you once called home. Everything was familiar. I still remembered how to go from point A to point B, but not necessarily the road names. And yet, so much of the city was different. It had grown in the 4 years since I had last been there. There has been so much development and subtle changes, almost as if the city was growing up so to speak. 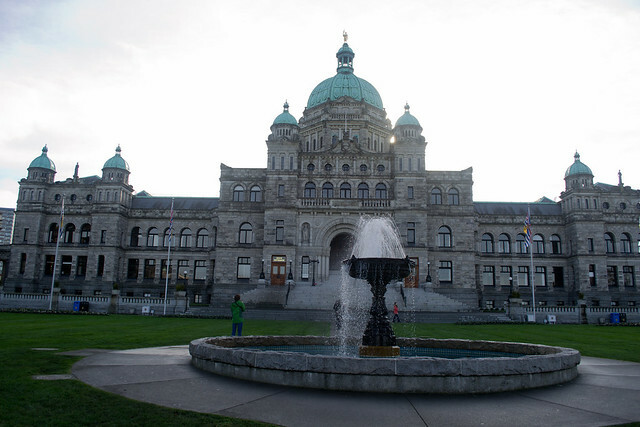 Victoria is the provincial capital of British Columbia and is the oldest city in Western Canada, established by the Hudson’s Bay Company in 1843 as a trading post. 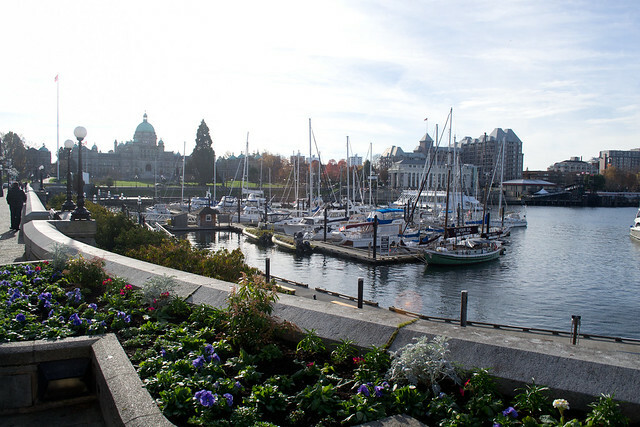 Victoria was named after Queen Victoria and accordingly, is Canada’s most British city. Everywhere you go, you can see glimpses into its past with the beautiful Victorian and Edwardian buildings throughout the city. Victoria is a 90 minute boat ride from the mainland on BC Ferries. This route was once so familiar to me as I made a crossing once every month or two. I had a favorite seat on the ferry, I knew where everything was. There was a routine, but since I’ve graduated, they’ve introduced new ferries which left me really disoriented. I was really surprised too by how many people there were on the ferry for a random November weekend. There were barely any seats available. I don’t remember that being a problem before. 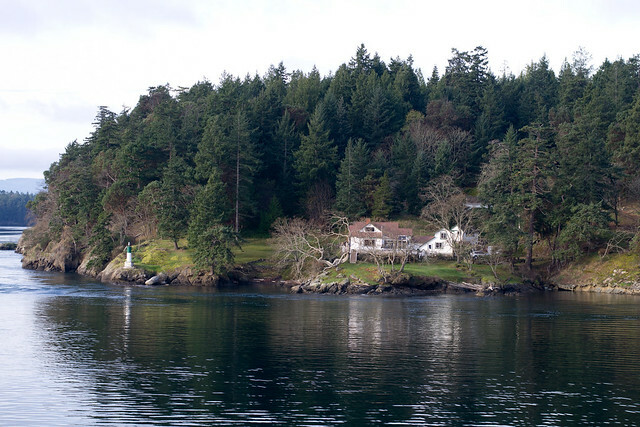 About 45 minutes into the journey, the boat slows down and you make your way through the gulf islands. This is my favorite part of the journey as you get to see the islands up close. The boat going the other direction passes you and you can truly appreciate how big it is. Outside, it is bitingly cold as the wind and cold air nips at every part of exposed skin. A perfectly timed shot. I can imagine the bird going “boo” as my shutter clicked. From the ferry, it is an hour’s bus ride to downtown Victoria, on, in true British fashion, a double decker bus! 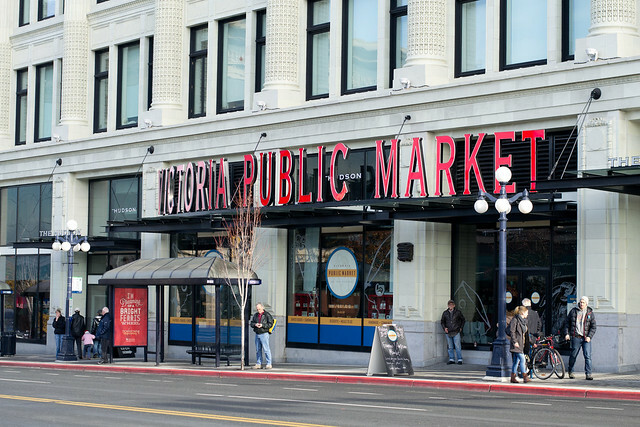 The Victoria Public Market was the first place I went to check out. I use to live just around the corner from here and had watched the building be demolished, be turned into a hole and the makings of a new building. Plus, I love visiting markets when traveling and I was desperate for some food after not really eating much breakfast. My initial impression is that it is smaller than I thought it would be. I had envisioned it to be much more open concept, but a lot of the space was taken up by other businesses in the building, not just the market. There were plenty of fruit and veggies being sold and lots of delicious looking pies and pastries. 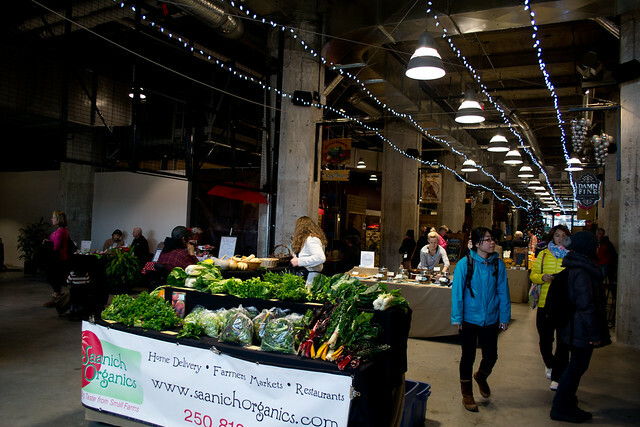 In terms of food options, there were plenty, from Sutra, an offshoot from the famous Indian restaurant in Vancouver, Vij’s, to Cowichan Bay Seafood to the Victoria Pie Co. 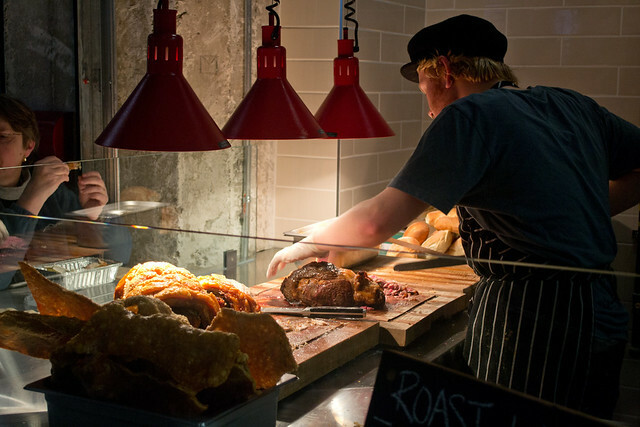 I ultimately went with Roast Carvery. Their display of delicious crackling had me. 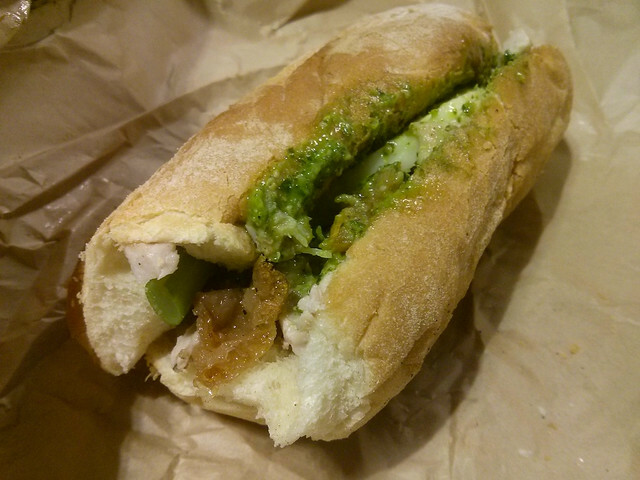 I ordered the Porchetta which came with provolone cheese and broccoli rabe. It was crunchy, and delicious in all the right ways. I definitely made a mess with sauce going every which way, but aren’t the best sandwiches like that? 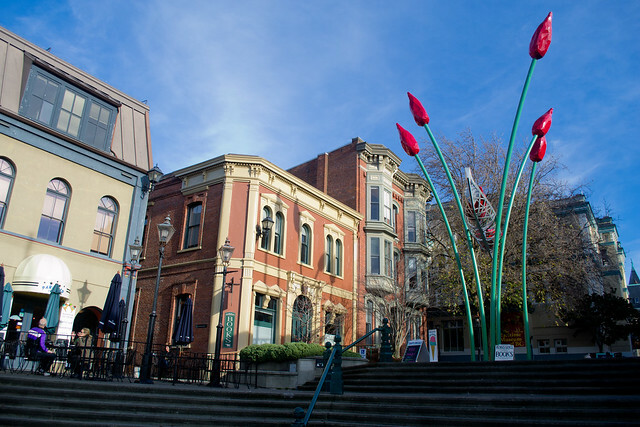 I had forgotten how much I liked the buildings in downtown Victoria. You don’t have a high rises that dominate the skyline like in other cities. Most buildings are fairly low, with the occasional apartment or hotel building standing out and yet, for some reason, I don’t even notice them. Probably because I’m spending all my time looking at all the adorable buildings. They’re all painted in fanciful colours. Almost as if you were were in a themepark. Brights reds and yellows next to neon blues and greens. There are a lot of eclectic stores in the area. Most of them privately owned businesses, not a part of a chain or brand. Each of them are unique in their own way. Wandering through them, you’re never too sure what you’ll find. 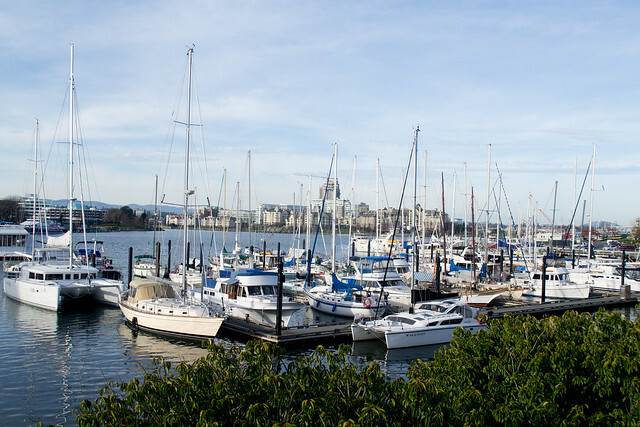 The harbour area of Victoria has got to be one of the most beautiful that I have ever visited. With the classy Empress hotel dominating one side and the Parliament buildings on the other, there is much to look at and take in. Despite the fact that I’ve probably been here 100s of times, it still manages to awe me. I was fortunate to have great weather during my visit and I loved the contrast between the white boats bobbing up and down on the deep blue waters of the harbour. The harbour is one of the world’s few natural harbour. With many activities that you can do in the area. In the summers, this area would be lined with street artists perfecting their craft and entertaining the crowds. Local merchants would line one side of the harbour selling their wares. There were massive throngs of tourists as they explore this area. 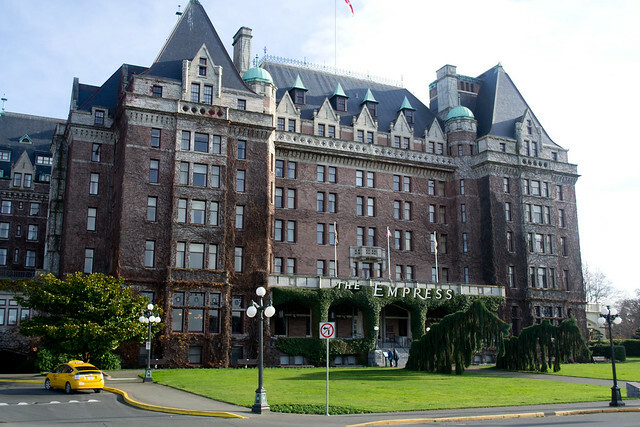 Afternoon tea at the Empress perhaps? 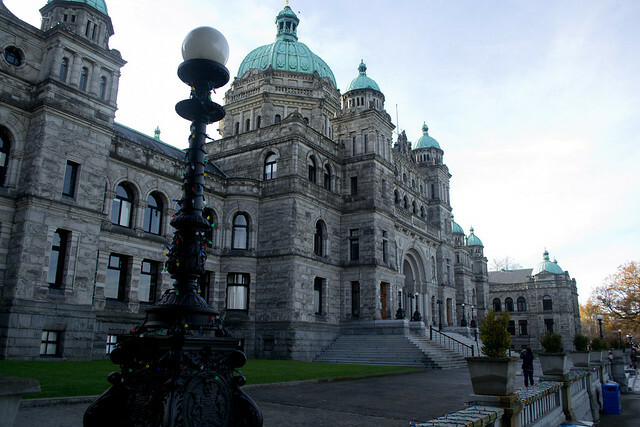 Victoria, being the provincial capital, has a dominating Parliament building where the BC Legislative Assembly meet to discuss how to run this province. You can sign up for free tours of the building year round, or go on a self-guided tour, and get an inside glimpse into what makes this province click. Even if you don’t have time for the tour, a wander through the grounds is more than worth it. Get up close to the building and you will feel how large this building really is. Sometimes you will see this building being called the Legislative Building, but it is in fact called the Parliament Building. But don’t confuse this with the one in Ottawa, the capital of Canada. There is no set term for the buildings in which each provincial government meets. Every province has their own name. For example, in Quebec, the Members of the National Assembly (MNA) meet in the Hôtel du Parlement. In both Prince Edward Island and Nova Scotia, the Members of the Legislative Assembly (MLA) meet in Province House. In Newfoundland and Labrador, the Members of the House of Assembly (MHA) meet in the Confederation Building. In the evening, I had arranged to meet up with some university friends, some of whom I haven’t seen since graduation. Between all our travels, a meet up just didn’t happen. I wanted to go someplace that I hadn’t been to before and settled on the Yates Street Taphouse which was really busy the night we were there. A couple of drinks, and lots of catching up. There are plenty of Irish bars and British themed pubs in the city as well. A few of my favorite include Irish Times, Bard and Banker and the Sticky Wicket. There are also a lot of really great microbreweries in the city worth checking out: Swan’s Brewpub, Spinnakers, and Canoe Brewpub to name a few. Readers of my last post will know that no visit to Victoria is complete without some brunch. An opportunity to catch up with even more friends and to linger over some delicious breakfast fare. 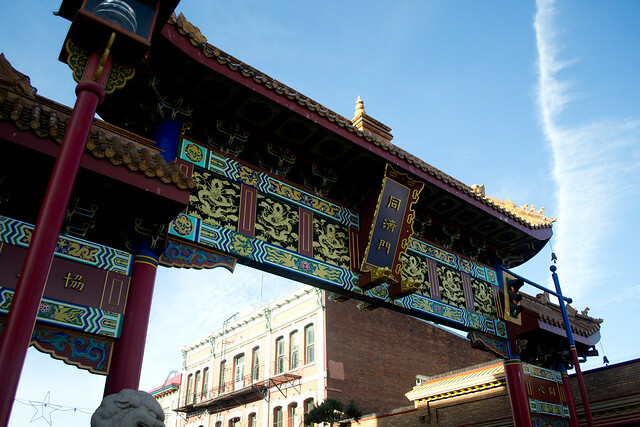 Did you know Victoria is home to the oldest Chinatown in all of Canada? It is second in North America only to the one in San Francisco. When you look at it, it doesn’t seem like much. A decorative gate and a street or two of Chinese shops and restaurants. Nothing like the massive ones in Vancouver and Toronto. But this is where it all started when a mass influx of miners came from California in the 1850s due to the discovery of gold in the Fraser Canyon. The area has been designated a National Historic Site of Canada and many buildings are of historical and cultural importance. 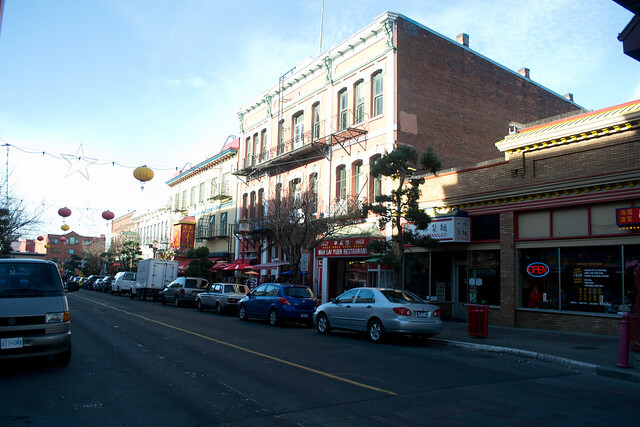 But now, it lacks the hustle and bustle, the life that I associate with Chinatowns, that it once had. Even though plenty of time had pass since my last visit, going back to Victoria was like visiting an old friend. Familiarity all around, but still plenty of new to catch up on. You notice how time has changed each other and how over time both have grown and developed. But regardless of the length of time apart, you can still find plenty to talk about and share. Each ride on the transit system in Victoria is $2.50. There are no zones. If you will be riding the bus more than once, it might be worth it to purchase a day pass for $5. You can purchase them on the ferry in the gift shop. Alternatively, if you don’t want to take public transit, you can also buy tickets on the Pacific Coach Line which can take you from downtown to downtown. You can also drive a car on board, but it can be fairly expensive. 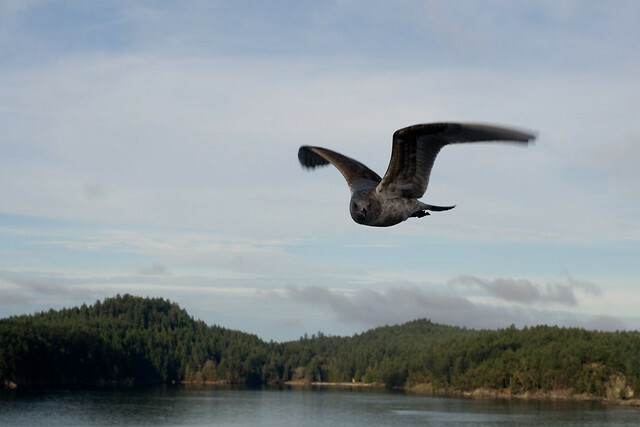 Fares for the BC Ferries tend to change every year it seems. Currently at the time of writing they are $15.50 for a walk on passenger, but you can check the current rate for the route on their website. 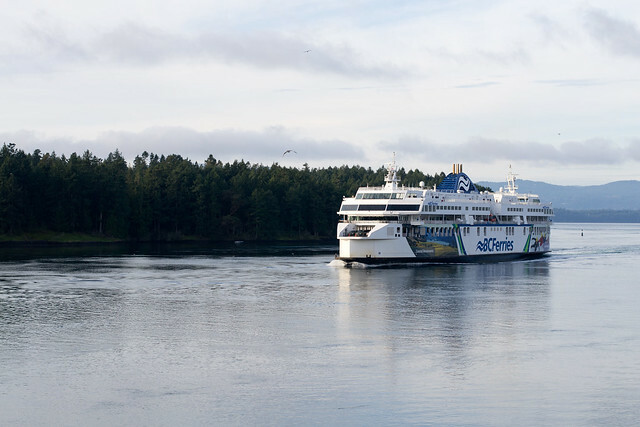 Ferries generally run every two hours with a journey time of 1 hour and 35 minutes. In the summers, they run more frequently. Check the schedule here. Have you gone back to a place that you once called home? What was the experience like? Great post Adelina, I think it’s been far too long since I have been in Victoria (I think since graduating 3 years ago, I’ve only been back . It is definitely one of the prettiest cities in all of Canada (and probably North America). There’s such a wonderful vibe to the city – not to mention the great architecture, food, and nearby nature. It’s funny that so many tourists visit the Inner Harbour and James Bay and don’t know that it was all filled in just over 100 years ago! Glad to be reading some posts about beautiful BC! Thanks Travis! I definitely agree – I love the vibe of the city. You’ll be surprised at how much it has changed, and yet also how much it has stayed the same. I’m a bit sad that some of the local stores have since been replaced by bigger brands creeping their way onto the island, but all my favorite places are still alive and kicking. I really like Victoria, and that says a lot since I’m not a city person at all. It feels much more like a large town, I think the lack of tall buildings helps, as you pointed out. I love visiting in the summer and looking at all the art around the harbour. Yes! I like to think of it as a big little town. There are aspects of a big city, but it’s also so easy to just escape from it all and head to a quiet beach or park if needed. I’m glad you enjoyed Victoria. I feel like the city is one big secret. I look forward to seeing Guam through your eyes! I’ve never been so it’ll be fun to see it.